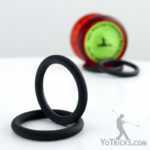 Add weight rings to your Luminator yoyo. Add Weight Rings to the Luminator Yoyo TrickIn this video I am going to teach you how to put your weight rings into your Luminator. Weight rings, they just add a little bit of weight to the outside edge of the Luminatior just underneath the cap. That allows the yoyo to sleep a little bit longer, it gives you a little bit more control because of the weight, and it feels really nice in your hand. That is what this video is all about. If you want to get these weight rings in your Luminator, the first thing you have to do is take off these caps. 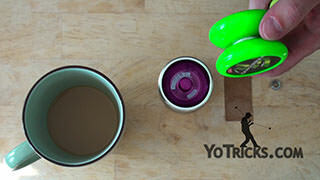 The easiest way that I have found to do that is first to take the yoyo apart. If the bearing comes off easily just take that off and set it off to the side. We won’t be needing that. Next, take the half with the bold. You just want to push on the bolt a little bit and that will cause the cap to pop right off. You can set that off to the side. That will also pop off the little plastic piece that holds the bolt down. Set that off to the side as well. Now that the caps are off you can take your weight ring and you just want to press it right onto the inside of the cap, just like this. It fits in there really snug which is nice, it is not going to be bouncing around there on the inside making any noise while you are playing, which is great. You just want to push it all the way down to the bottom and that is going to ensure that the weight is distributed evenly around the inside. Once you are done with that you are not really done with the bolt. You want to pop that out and set this half off to the side. Take your other half and push the bolt right on through. That will allow you to pop the caps off of the other side. Again you can just set those off to the side. Take the nut, set that off to the side along with the other plastic piece. Now you are done with the bolt. Take your second weight ring and push it right on in just like the other weight ring. Once you have gotten that in the way that you want it you want to take your bolt and put it in… or your nut rather. You want to take your little plastic piece and fit that on top to keep the nut secure. Take your little plastic side caps here and stick those on. You want to reassemble the other half. Put in the bolt, pull it down so that it is secure. Take the plastic piece and put that right on top. Put in your side caps. Don’t forget about the bearing… you want to put that in. You can just take your halves and put them back together. And that is how you add your weight rings to the Luminator.